One of the most common questions DIY decorators and homeowners ask is how much lighting do I need? This is a question that needs to be addressed before the light shopping process begins as it doesn't make a lot of sense to pick out a light you really like only to discover it doesn't give off enough off light. When the "How Much" question is asked it is most often refering to how much general light or "ambient" light does a room need. The answer is mathematical and yet it isn’t, meaning there are a number of variables that play into the equation. For instance will there be natural outside light, is there any task or accent lighting in the room as well? If so, depending upon the use of the room, possibly you can get away with slightly less than the industry standard. However, in workspaces like kitchens you want to make sure you have adequate lighting. If you kitchen does not have any task or counter lighting you will want to make sure you have the recommended wattage or slightly above to compensate for lack of lighting on the counter workspace. To calculate how much wattage you need in a room, as a rule you take, Room Width x Room Length x 1.5 = Amount of Incandescent Wattage necessary to light a room. For instance a room which measures 12’ x 14’ x 1.5 = 252 incandescent watts minimum ambient lighting. 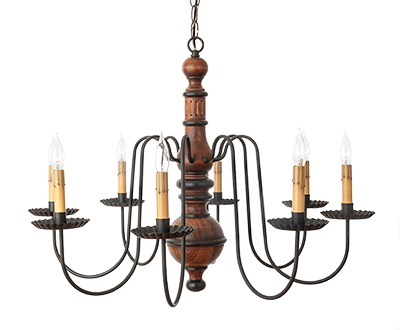 This can be divided between several sources, for example: 1 chandelier with 160 watts and 2 lamps with 75 watts each would be more than sufficient. If you are using fluorescent or LED bulbs use the chart below to figure out your wattage requirements. One thing to keep in mind is it is better to have too much light than not enough; you can always use a dimmer switch or lower wattage bulbs to decrease unnecessary light. However it is not a good experience when you are trying to read in a room that is to dark. For those of you primitive lighting enthusiasts, it has been our experience that log homes with exposed log walls on the interior and/or exposed tongue and groove wood ceilings tend to take a bit more lighting than drywall homes do.